Well, the Brewers season is officially over. The Crew will not be playing baseball again until next April. I know most of you have moved on already, but for others, it isn't that easy. Sure, this was a disappointing season, and the lack of brewers baseball in our lives isn't as big of a shock to the system as it was in 2007 and even more so in 2008, but it still leaves a void to some. 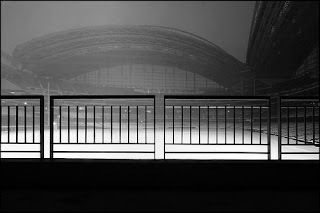 I wrote some tips earlier this year at Sheffield's House on how to survive the All-Star Break, but for those who need to know how to pass their time in the winter months without the Brewers I offer up some tips other than your standard Packers, Badgers, and lord help you, Bucks games. You read that right. Just because the Brewers aren't playing, doesn't mean you have to stop drinking at your favorite summertime drunk stop. If you want to pull into t he lot on a snowy day and fire up the grill, then you are a true tailgate trooper. If security tries to hassle you, just say you are waiting for the clubhouse store to open up because they have this new style hooded sweatshirt that your little nephew has been wanting to get since he first heard of it. Security won't know what to say and might just leave you alone. The most feasible way to get yourself inebriated though, is to head to Friday's, which is open year round. It's a weird site to see a dark, empty, snow filled stadium...but after a couple of their famous long island iced teas, you'll be cheering like its game day! After all, they do have a Brewers patch on their jerseys, plus per the ever reliable wikipedia, Mark Atta nasio and Gord Ash have a stake in the team (not sure if Ben Sheets still does or not). I've been to one game in my life, but this year I want to try and become a regular. The tickets are cheap, live hockey is always a blast, and there is beer to be drank. If those three reasons aren't enough to lure you, let me repeat, there is beer to be drank. They have a pretty sweet logo, so, there is that as well. Picture this evening: you start out the night in one of the sports bars by the stadium, then you head to the BC, then after the game you are just a short walk to the bar scene...perfect! For more information, please visit the Admirals website. 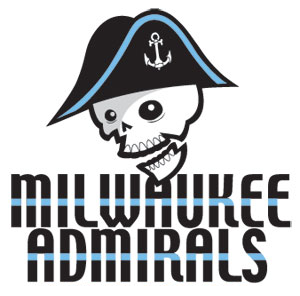 And when you can't catch the game, be sure to get your Admiral updates from The Sports Bubbler's dedicated Admirals blog. Fantasy is in, and come December, if you are like me, you are yearning for baseball to be back. This yearning, is what makes the winter meetings a bigger deal than they are. I am actually reasonably certain that it is an elaborate excuse for the General Managers to go on a vacation and drink it up. There are always big talks and big rumors, but it always seems like it just that, talk. Sure, there is a move made here and there to help us believe that it is legit. So, how do you win in a fantasy version? You and your friends go to the bar and talk baseball and potential trades. It'll be just like the real thing. If you want to go all out, rent a conference hall at a fancy hotel. Always relive great Brewers moments every time you get a call. For you blackberry users, here is a link to Uecker's great call after Braun's HR that sent the Brewers into the playoff. I think his voice is somewhere in there, all I can hear is fan pandemonium...or fandemonium if you will. It'll be so exciting to know just when baseball will start to get back in the swing of things. Plus, you can annoy amaze your friends when you say, "Only 86 more days until pitchers and catchers report". Then you can be twice as disappointed when they finally do and you remember real baseball and subsequently, spring are still a month and a half away. Have you always wanted to try something new on the grill, but been too scared to look foolish at the tailgate? Well, the winter is the perfect time to try out new recipes. Maybe you can even try Chef Jerry Garcia's tailgate tips! You don't want to have to experiment on Opening Day and look like a fool when you make bad tasting pork chops when you could have had a reliable, tasty bratwurst. Bonus points for grilling during a blizzard. I don't know who the dude is in the picture, but he gets whats up. This doesn't exist, to my knowledge, but why not be a pioneer. 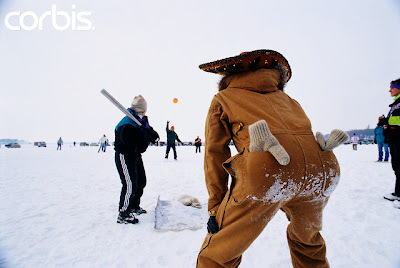 I've played ice kickball, and can assume snow softball (or better yet, ice softball) would be equally as fun. I can hear it now, "Oh no, Lange just slipped and busted his head rounding third, that's almost as embarrassing as the Cubs 2009 season!" Just make sure to bring the brandy for that cozy, yet false, warmth. I would play snow softball in a heartbeat.